In Greek religion and mythology, Pan (/ˈpæn/; Ancient Greek: Πάν, Pan) is the god of the wild, shepherds and flocks, nature of mountain wilds and rustic music, and companion of the nymphs. His name originates within the Ancient Greek language, from the word paein (πάειν), meaning “to pasture”; the modern word “panic” is derived from the name. He has the hindquarters, legs, and horns of a goat, in the same manner as a faun or satyr. 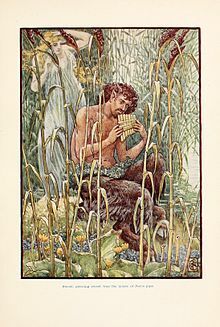 With his homeland in rustic Arcadia, he is also recognized as the god of fields, groves, and wooded glens; because of this, Pan is connected to fertility and the season of spring. The ancient Greeks also considered Pan to be the god of theatrical criticism. 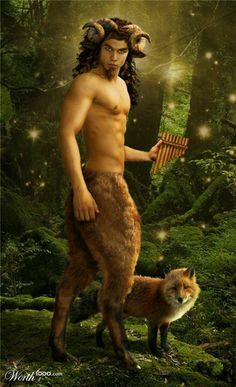 In Roman religion and myth, Pan’s counterpart was Faunus, a nature god who was the father of Bona Dea, sometimes identified as Fauna; he was also closely associated with Sylvanus, due to their similar relationships with woodlands. 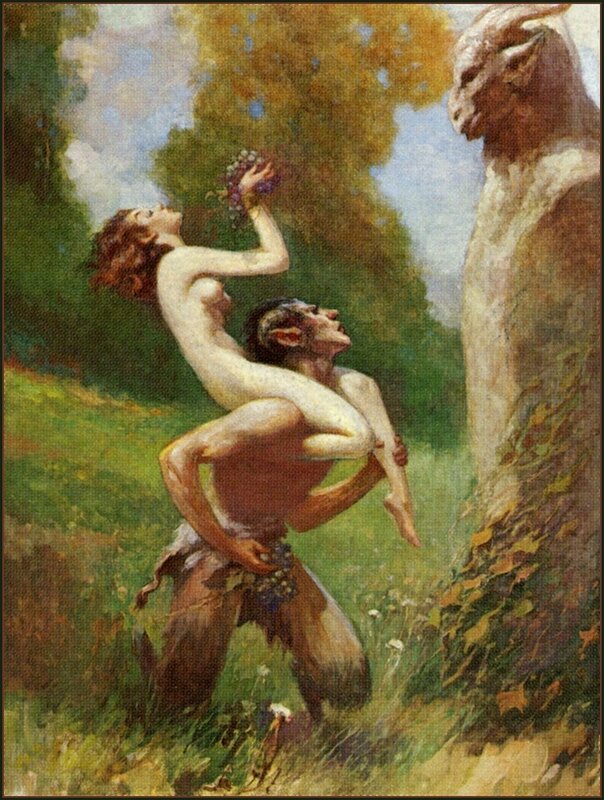 In the 18th and 19th centuries, Pan became a significant figure in the Romantic movement of western Europe and also in the 20th-century Neopagan movement. An area in the Golan Heights known as the Panion or Panium is associated with Pan. The city of Caesarea Philippi, the site of the Battle of Panium and the Banias natural spring, grotto or cave, and related shrines dedicated to Pan, may be found there. In his earliest appearance in literature, Pindar‘s Pythian Ode iii. 78, Pan is associated with a mother goddess, perhaps Rhea or Cybele; Pindar refers to virgins worshipping Cybele and Pan near the poet’s house in Boeotia. The parentage of Pan is unclear; generally he is the son of Hermes, although occasionally in some mythshe is the son of Zeus, or Dionysus, with whom his mother is said to be a wood nymph, sometimes Dryope or, even in the 5th-century AD source Dionysiaca by Nonnus (14.92), Penelope of Mantineia in Arcadia. In some early sources such as Pindar, his father is Apollo via Penelope, the wife of Odysseus. Herodotus (2.145), Cicero (ND 3.22.56), Apollodorus(7.38) and Hyginus (Fabulae 224) all make Hermes and Penelope his parents. Pausanias 8.12.5 records the story that Penelope had in fact been unfaithful to her husband, who banished her to Mantineia upon his return. Other sources (Duris of Samos; the Vergilian commentator Servius) report that Penelope slept with all 108 suitors in Odysseus’ absence, and gave birth to Pan as a result. This myth reflects the folk etymology that equates Pan’s name (Πάν) with the Greek word for “all” (πᾶν). It is more likely to be cognate with πάειν paein, “to pasture”, and to share an origin with the modern English word “pasture”. In 1924, Hermann Collitz suggested that Greek Pan and Indic Pushan might have a common Indo-European origin. In the mystery cults of the highly syncretic Hellenistic era Pan is made cognate with Phanes/Protogonos, Zeus, Dionysus and Eros. Accounts of Pan’s genealogy are so varied that it must lie buried deep in mythic time. Like other nature spirits, Pan appears to be older than the Olympians, if it is true that he gave Artemis her hunting dogs and taught the secret of prophecy to Apollo. Pan might be multiplied as the Pans (Burkert 1985, III.3.2; Ruck and Staples, 1994, p. 132) or the Paniskoi. Kerenyi (p. 174) notes from scholia that Aeschylus in Rhesus distinguished between two Pans, one the son of Zeus and twin of Arcas, and one a son of Cronus. “In the retinue of Dionysos, or in depictions of wild landscapes, there appeared not only a great Pan, but also little Pans, Paniskoi, who played the same part as the Satyrs“. The Roman Faunus, a god of Indo-European origin, was equated with Pan. The worship of Pan began in Arcadia which was always the principal seat of his worship. Arcadia was a district of mountain people, culturally separated from other Greeks. Greek hunters used to scourge the statue of the god if they had been disappointed in the chase (Theocritus. vii. 107). Being a rustic god, Pan was not worshipped in temples or other built edifices, but in natural settings, usually caves or grottoes such as the one on the north slope of the Acropolis of Athens. These are often referred to as the Cave of Pan. The only exceptions are the Temple of Pan on the Neda Rivergorge in the southwestern Peloponnese – the ruins of which survive to this day – and the Temple of Pan at Apollonopolis Magna in ancient Egypt. In the 4th century BC Pan was depicted on the coinage of Pantikapaion. The goat-god Aegipan was nurtured by Amalthea with the infant Zeus in Athens. In Zeus’ battle with Gaia, Aegipan and Hermes stole back Zeus’ “sinews” that Typhon had hidden away in the Corycian Cave. Pan aided his foster-brother in the battle with the Titans by letting out a horrible screech and scattering them in terror. According to some traditions, Aegipan was the son of Pan, rather than his father. One of the famous myths of Pan involves the origin of his pan flute, fashioned from lengths of hollow reed. Syrinxwas a lovely wood-nymph of Arcadia, daughter of Landon, the river-god. As she was returning from the hunt one day, Pan met her. To escape from his importunities, the fair nymph ran away and didn’t stop to hear his compliments. He pursued from Mount Lycaeum until she came to her sisters who immediately changed her into a reed. When the air blew through the reeds, it produced a plaintive melody. The god, still infatuated, took some of the reeds, because he could not identify which reed she became, and cut seven pieces (or according to some versions, nine), joined them side by side in gradually decreasing lengths, and formed the musical instrument bearing the name of his beloved Syrinx. Henceforth Pan was seldom seen without it. Echo was a nymph who was a great singer and dancer and scorned the love of any man. This angered Pan, a lecherous god, and he instructed his followers to kill her. Echo was torn to pieces and spread all over earth. The goddess of the earth, Gaia, received the pieces of Echo, whose voice remains repeating the last words of others. In some versions, Echo and Pan had two children: Iambe and Iynx. In other versions, Pan had fallen in love with Echo, but she scorned the love of any man but was enraptured by Narcissus. As Echo was cursed by Hera to only be able to repeat words that had been said by someone else, she could not speak for herself. She followed Narcissus to a pool, where he fell in love with his own reflection and changed into a narcissus flower. Echo wasted away, but her voice could still be heard in caves and other such similar places. Pan also loved a nymph named Pitys, who was turned into a pine tree to escape him. Disturbed in his secluded afternoon naps, Pan’s angry shout inspired panic (panikon deima) in lonely places. Following the Titans’ assault on Olympus, Pan claimed credit for the victory of the gods because he had frightened the attackers. In the Battle of Marathon (490 BC), it is said that Pan favored the Athenians and so inspired panic in the hearts of their enemies, the Persians. Pan is famous for his sexual powers, and is often depicted with a phallus. Diogenes of Sinope, speaking in jest, related a myth of Pan learning masturbation from his father, Hermes, and teaching the habit to shepherds. Pan’s greatest conquest was that of the moon goddess Selene. He accomplished this by wrapping himself in a sheepskin to hide his hairy black goat form, and drew her down from the sky into the forest where he seduced her. In two late Roman sources, Hyginus and Ovid, Pan is substituted for the satyr Marsyas in the theme of a musical competition (agon), and the punishment by flaying is omitted. Pan once had the audacity to compare his music with that of Apollo, and to challenge Apollo, the god of the lyre, to a trial of skill. Tmolus, the mountain-god, was chosen to umpire. Pan blew on his pipes and gave great satisfaction with his rustic melody to himself and to his faithful follower, Midas, who happened to be present. Then Apollo struck the strings of his lyre. Tmolus at once awarded the victory to Apollo, and all but Midas agreed with the judgment. Midas dissented and questioned the justice of the award. Apollo would not suffer such a depraved pair of ears any longer and turned Midas’ ears into those of a donkey. In another version of the myth, the first round of the contest was a tie, so the competitors were forced to hold a second round. In this round, Apollo demanded that they play their instruments upside-down. Apollo, playing the lyre, was unaffected. However, Pan’s pipe could not be played while upside down, so Apollo won the contest. The constellation Capricornus is traditionally depicted as a sea-goat, a goat with a fish’s tail (see “Goatlike” Aigaion called Briareos, one of the Hecatonchires). A myth reported as “Egyptian” in Hyginus‘ Poetic Astronomy that would seem to be invented to justify a connection of Pan with Capricorn says that when Aegipan — that is Pan in his goat-god aspect — was attacked by the monster Typhon, he dove into the Nile; the parts above the water remained a goat, but those under the water transformed into a fish. 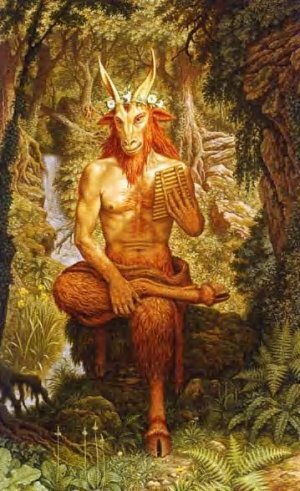 Aegocerus “goat-horned” was an epithet of Pan descriptive of his figure with the horns of a goat. Pan could be multiplied into a swarm of Pans, and even be given individual names, as in Nonnus‘ Dionysiaca, where the god Pan had twelve sons that helped Dionysus in his war against the Indians. Their names were Kelaineus, Argennon, Aigikoros, Eugeneios, Omester, Daphoenus, Phobos, Philamnos, Xanthos, Glaukos, Argos, and Phorbas. Two other Pans were Agreus and Nomios. Both were the sons of Hermes, Agreus’ mother being the nymph Sose, a prophetess: he inherited his mother’s gift of prophecy, and was also a skilled hunter. Nomios’ mother was Penelope (not the same as the wife of Odysseus). He was an excellent shepherd, seducer of nymphs, and musician upon the shepherd’s pipes. Most of the mythological stories about Pan are actually about Nomios, not the god Pan. Although, Agreus and Nomios could have been two different aspects of the prime Pan, reflecting his dual nature as both a wise prophet and a lustful beast. Aegipan, literally “goat-Pan,” was a Pan who was fully goatlike, rather than half-goat and half-man. When the Olympians fled from the monstrous giant Typhoeus and hid themselves in animal form, Aegipan assumed the form of a fish-tailed goat. Later he came to the aid of Zeus in his battle with Typhoeus, by stealing back Zeus’ stolen sinews. As a reward the king of the gods placed him amongst the stars as the Constellation Capricorn. The mother of Aegipan, Aix (the goat), was perhaps associated with the constellation Capra. Sybarios was an Italian Pan who was worshipped in the Greek colony of Sybaris in Italy. The Sybarite Pan was conceived when a Sybarite shepherd boy named Krathis copulated with a pretty she-goat amongst his herds. According to the Greek historian Plutarch (in De defectu oraculorum, “The Obsolescence of Oracles”), Pan is the only Greek god (other than Asclepius) who actually dies. During the reign of Tiberius (A.D. 14–37), the news of Pan’s death came to one Thamus, a sailor on his way to Italy by way of the island of Paxi. A divine voice hailed him across the salt water, “Thamus, are you there? When you reach Palodes, take care to proclaim that the great god Pan is dead.” Which Thamus did, and the news was greeted from shore with groans and laments. Christian apologists such as G. K. Chesterton repeated and amplified the significance of the “death” of Pan, suggesting that with the “death” of Pan came the advent of theology. To this effect, Chesterton once said, “It is said truly in a sense that Pan died because Christ was born. It is almost as true in another sense that men knew that Christ was born because Pan was already dead. A void was made by the vanishing world of the whole mythology of mankind, which would have asphyxiated like a vacuum if it had not been filled with theology.” It was interpreted with concurrent meanings in all four modes of medieval exegesis: literally as historical fact, and allegorically as the death of the ancient order at the coming of the new. [original research?] Eusebius of Caesarea in his Praeparatio Evangelica (book V) seems[dubious – discuss] to have been the first Christian apologist to give Plutarch’s anecdote, which he identifies as his source, pseudo-historical standing, which Eusebius buttressed with many invented passing details that lent verisimilitude. In more modern times, some have suggested a possible a naturalistic explanation for the myth. For example, Robert Graves (The Greek Myths) reported a suggestion that had been made by Salomon Reinach and expanded by James S. Van Teslaar that the hearers aboard the ship, including a supposed Egyptian, Thamus, apparently misheard Thamus Panmegas tethneke ‘the all-great Tammuz is dead’ for ‘Thamus, Great Pan is dead!’, Thamous, Pan ho megas tethneke. “In its true form the phrase would have probably carried no meaning to those on board who must have been unfamiliar with the worship of Tammuz which was a transplanted, and for those parts, therefore, an exotic custom.” Certainly, when Pausanias toured Greece about a century after Plutarch, he found Pan’s shrines, sacred caves and sacred mountains still very much frequented. However, a naturalistic explanation might not be needed. For example, William Hansen has shown that the story is quite similar to a class of widely known tales known as Fairies Send a Message. The cry “Great Pan is dead” has appealed to poets, such as John Milton, in his ecstatic celebration of Christian peace, On the Morning of Christ’s Nativityline 89, and Elizabeth Barrett Browning. One remarkable commentary of Herodotus on Pan is that he lived 800 years before himself (c. 1200 BCE), this being already after the Trojan War. In the English town of Painswick in Gloucestershire, a group of 18th-century gentry, led by Benjamin Hyett, organised an annual procession dedicated to Pan, during which a statue of the deity was held aloft, and people shouted ‘Highgates! Highgates!” Hyett also erected temples and follies to Pan in the gardens of his house and a “Pan’s lodge”, located over Painswick Valley. The tradition died out in the 1830s, but was revived in 1885 by the new vicar, W. H. Seddon, who mistakenly believed that the festival had been ancient in origin. One of Seddon’s successors, however, was less appreciative of the pagan festival and put an end to it in 1950, when he had Pan’s statue buried. In the late 19th century Pan became an increasingly common figure in literature and art. Patricia Merivale states that between 1890 and 1926 there was an “astonishing resurgence of interest in the Pan motif”. He appears in poetry, in novels and children’s books, and is referenced in the name of the character Peter Pan. He is the eponymous “Piper at the Gates of Dawn” in the seventh chapter of Kenneth Grahame‘s The Wind in the Willows(1908). Grahame’s Pan, unnamed but clearly recognisable, is a powerful but secretive nature-god, protector of animals, who casts a spell of forgetfulness on all those he helps. He makes a brief appearance to help the Rat and Mole recover the Otter’s lost son Portly. Arthur Machen‘s 1894 novella The Great God Pan uses the god’s name in a simile about the whole world being revealed as it really is: “seeing the Great God Pan”. The novella is considered by many (including Stephen King) as being one of the greatest horror stories ever written. Pan entices villagers to listen to his pipes as if in a trance in Lord Dunsany‘s novel The Blessing of Pan published in 1927. Although the god does not appear within the story, his energy certainly invokes the younger folk of the village to revel in the summer twilight, and the vicar of the village is the only person worried about the revival of worship for the old pagan god. Pan is also featured as a prominent character in Tom Robbins‘ Jitterbug Perfume (1984). Aeronautical engineer and occultist Jack Parsons invoked Pan before test launches at the Jet Propulsion Laboratory. The British writer and editor Mark Beech of Egaeus Press published in 2015 the limited-edition anthology Soliloquy for Pan which includes essays and poems such as “The Rebirthing of Pan” by Adrian Eckersley, “Pan’s Pipes” by Robert Louis Stevenson, “Pan With Us” by Robert Frost, and “The Death of Pan” by Lord Dunsany. Some of the beautifully detailed illustrated depictions of Pan included in the volume are by the artists Giorgio Ghisi, Sir James Thornhill, Bernard Picart, Agostino Veneziano, Vincenzo Cartari, and Giovanni Battista Tiepolo. Pan’s goatish image recalls conventional faun-like depictions of Satan. Although Christian use of Plutarch’s story is of long standing,[original research?] Ronald Hutton has argued that this specific association is modern and derives from Pan’s popularity in Victorian and Edwardian neopaganism. Medieval and early modern images of Satan tend, by contrast, to show generic semi-human monsters with horns, wings and clawed feet. 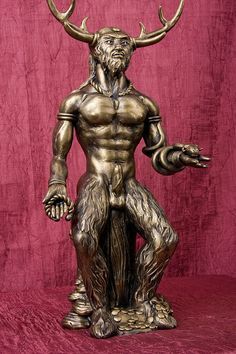 In 1933, the Egyptologist Margaret Murray published the book, The God of the Witches, in which she theorised that Pan was merely one form of a horned god who was worshipped across Europe by a witch-cult. 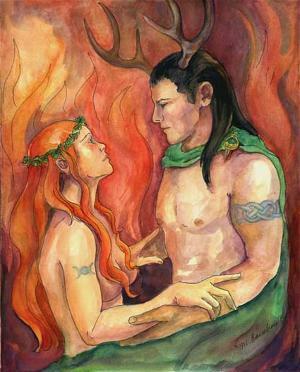 This theory influenced the Neopagan notion of the Horned God, as an archetype of male virility and sexuality. In Wicca, the archetype of the Horned God is highly important, as represented by such deities as the Celtic Cernunnos, Indian Pashupati, and Greek Pan. A modern account of several purported meetings with Pan is given by Robert Ogilvie Crombie in The Findhorn Garden (Harper & Row, 1975) and The Magic of Findhorn (Harper & Row, 1975). Crombie claimed to have met Pan many times at various locations in Scotland, including Edinburgh, on the island of Iona and at the Findhorn Foundation. Copyright by Luis Daniel Maldonado Fonken www.index.luisdanielmaldonadofonken.info All rights reserved.